The mansion at the corner of Washington and Lynde Streets in Salem, around 1910. Image courtesy of the Library of Congress, Detroit Publishing Company Collection. The house in the first photo was built in 1764, although it was extensively modified over the years. It was one of Salem’s finest 18th century mansions, and was home to some of the city’s most prominent residents, starting with merchant Benjamin Pickman (1707/8-1773). Originally from Boston, Pickman later came to Salem as a young man, where he became a prosperous merchant, with ships that were involved in trade with the West Indies. He also served as a colonel in the militia, a member of the colonial legislature and governor’s council, and as a judge. Pickman was about 56 years old when he built this house on Washington Street. He apparently lived here for the rest of his life, until his death in 1773, although historical records do not seem to specify. According to these sources, the house was “left by him to his son, Clarke Gayton Pickman,” leaving some ambiguity as to whether he personally lived in this house upon its completion, or simply had it built and then gave it to his son, a practice that was not uncommon among wealthy families of this period. Either way, his son Clarke (1746-1781) ultimately acquired the house, where he lived with his wife Sarah and their four children. However, he died young, at the age of 35, and his four children had even shorter lives. Both of his sons, Clark and Carteret, died in childhood, and his two daughters, Sally and Rebecca, only lived to be 20 and 28, respectively. Sarah only lived in this house for about a year after Clarke’s death, and sold the property in 1782. The next owner of this house was Elias Hasket Derby (1739-1799), who was probably the wealthiest of Salem’s many merchants. 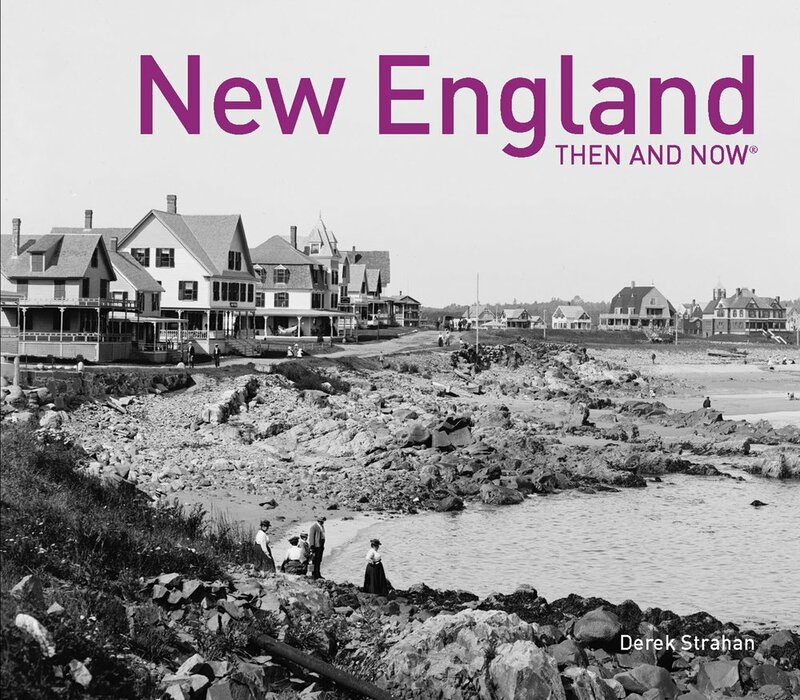 During the late 18th century, Salem was the seventh-largest city or town in the country, as well as the richest on a per capita basis, and Derby played a large role in this prosperity. The ships of his fleet were among the first American vessels to trade with China, and his shipping empire also included extensive trade with India, Mauritius, Sumatra, Europe, and the West Indies. Some 50 years after his death, he was even referred to as “King Derby” in Nathaniel Hawthorne’s introduction to The Scarlet Letter. In this lengthy polemic against his hometown, Hawthorne laments the decline of the once-prosperous city, equating Derby with the Salem’s golden age. Upon purchasing this house in 1782, Derby soon set about renovating it. He hired noted local architect Samuel McIntire, who made alterations to the original design. This included the addition of the cupola, which provided Derby with a view of the waterfront and his incoming ships. However, Derby soon began planning for a new house, and in the 1790s he hired Charles Bulfinch to design a mansion a little south of here, on the present-day site of the old town hall. Derby moved into this new house upon its completion in 1799, but he did not get to enjoy it for long, because he died later in the year. In the meantime, this house on Washington Street was acquired by Derby’s son, John Derby (1767-1831). 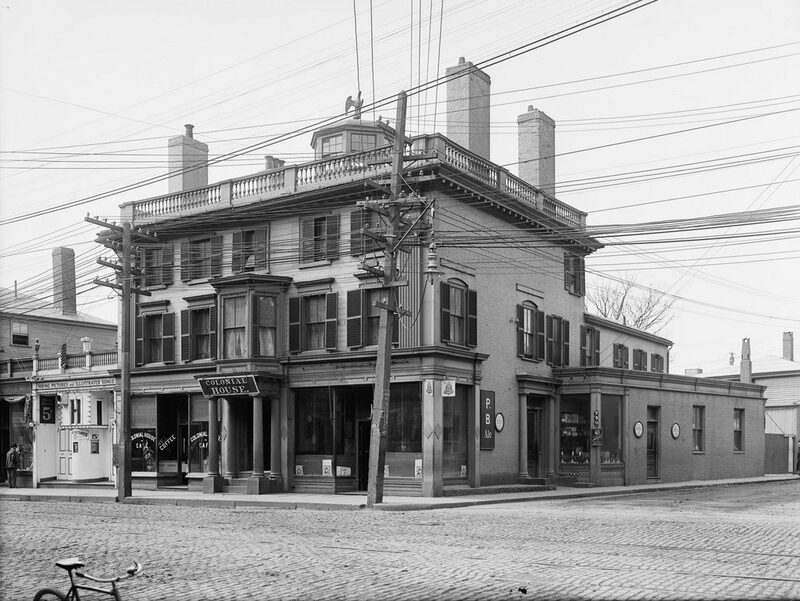 Like his father, he was also a merchant, but he was involved in other business interests here in Salem, such as the Salem Marine Insurance Company and the Salem Bank. His first wife, Sally, died in 1798, leaving him with three young children. However, in 1801 he remarried to Eleanor Coffin, and the couple had eight children of their own. Among their children was Sarah Ellen Derby, who married John Rogers and had nine children. Their oldest son, also named John Rogers (1829-1904), was born here in this house, and later went on to become a prominent sculptor. He specialized in small, mass-produced plaster statues, known as Rogers Groups, and these inexpensive pieces of artwork found their way into many homes across the country and overseas. John Derby died in 1831, and the house was subsequently sold to Robert Brookhouse. It would remain a single-family home throughout the 19th century, although it steadily declined over the years. This reflected the declining prosperity of Salem as a whole, which had peaked in its prominence as a seaport around the turn of the 19th century. It slowly dropped off the list of the ten largest cities in the country, and by the time Hawthorne published The Scarlet Letter in 1850 it had become a shadow of its former glory. 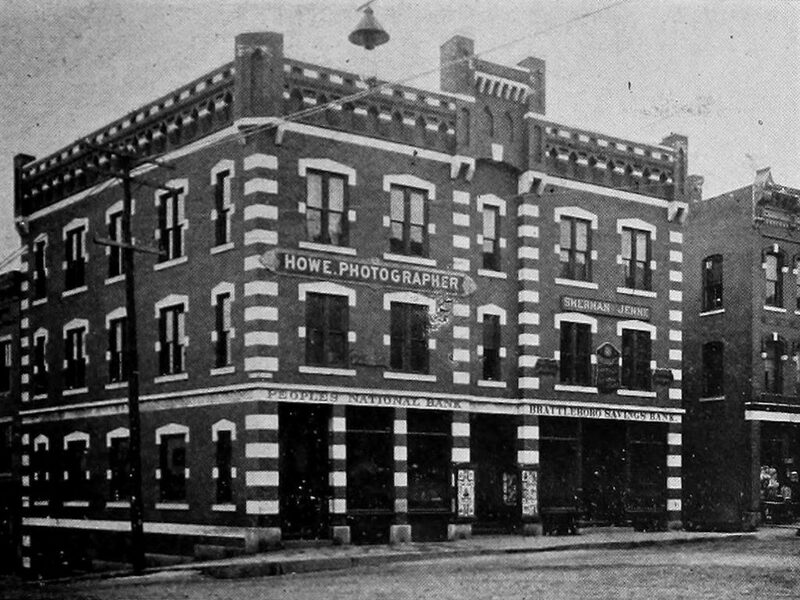 Only a few years after the first photo was taken, the property was sold to the Masonic lodge. The historic 150-year-old mansion was demolished in 1915, and the present-day Masonic Temple was built on the site. This large, Classical Revival-style building was completed in 1916, and featured stores and offices on the lower floors, while the upper floors were used by the Freemasons for office space and meeting rooms. The building was badly damaged by a fire in 1982, which caused over a million dollars in damage to the upper floors, but it was subsequently restored and is still standing. Along with the other nearby buildings, it is now part of the Downtown Salem Historic District, which was added to the National Register of Historic Places in 1983. Looking north on Main Street, from near the corner of Elliot Street in Brattleboro, around 1871-1885. Image courtesy of the New York Public Library. 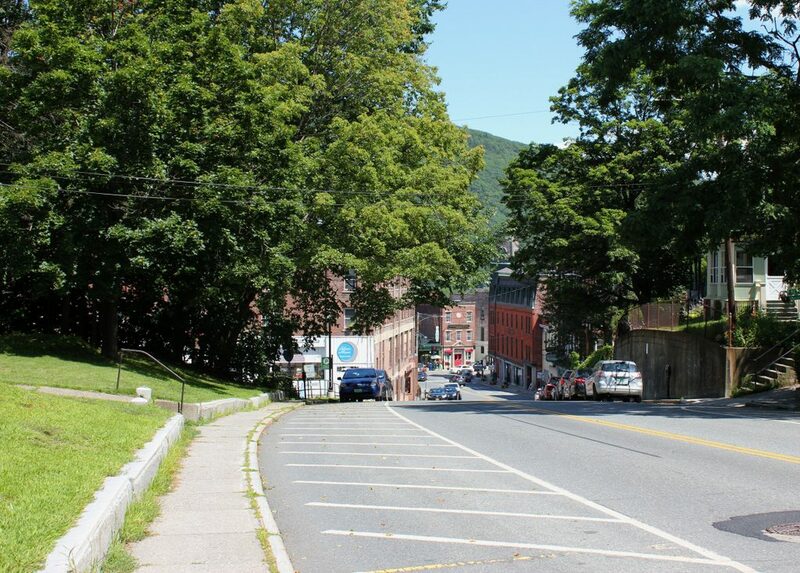 This block, on the west side of Main Street between Elliot and High Streets, was the scene of one of the most disastrous fires in Brattleboro history, which occurred on October 31, 1869. 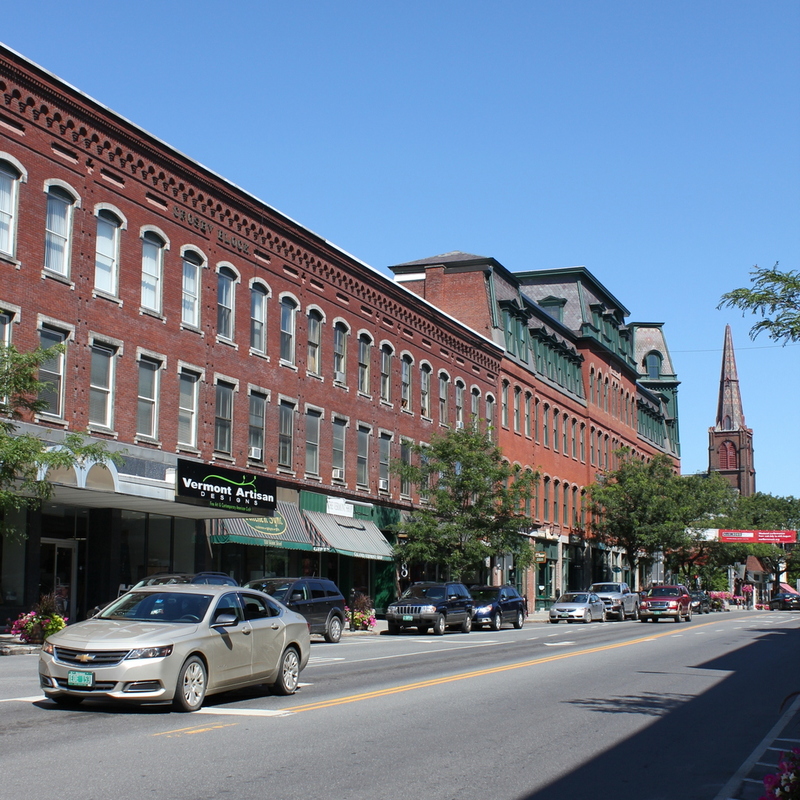 All of the buildings along this section of Main Street, mostly wood-frame stores and hotels, were destroyed in the fire, including the Brattleboro House hotel and several other important commercial blocks. However, the property was quickly redeveloped, and within two years the ruins had been replaced by two large, brick commercial buildings, with the Crosby Block on the left and the Brooks House further in the distance on the right. 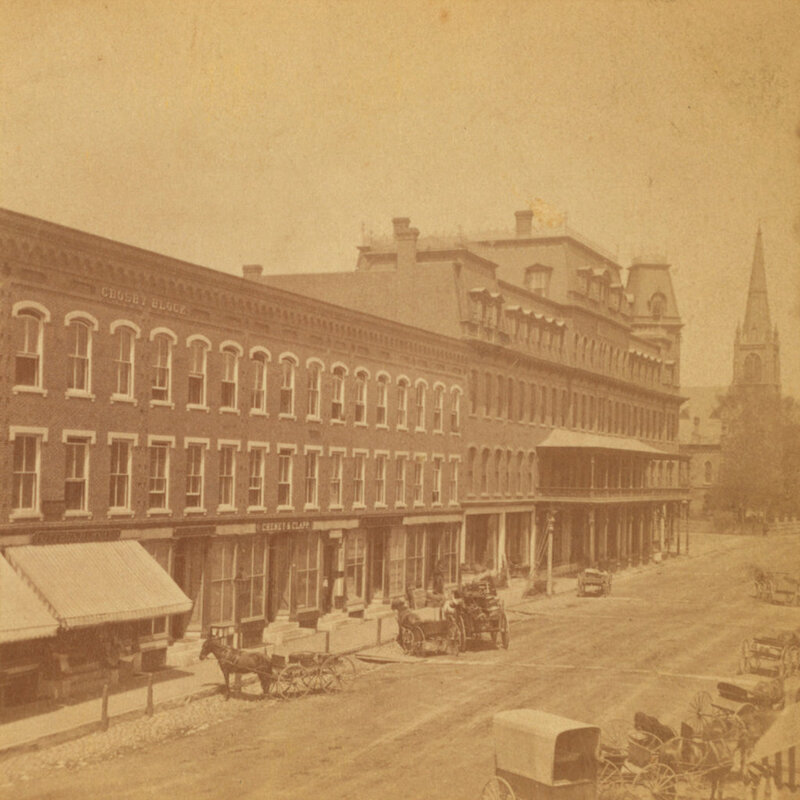 The first photo shows the Crosby Block as it appeared within about 15 years of its completion in 1871. It was owned by grain and flour merchant Edward Crosby, and was designed by local architect George A. Hines, whose plans reflected the prevailing Italianate style for commercial buildings of this era. Only about two thirds of the building is visible in this scene, as it was once 26 window bays wide, extending all the way to the corner of Elliot Street. 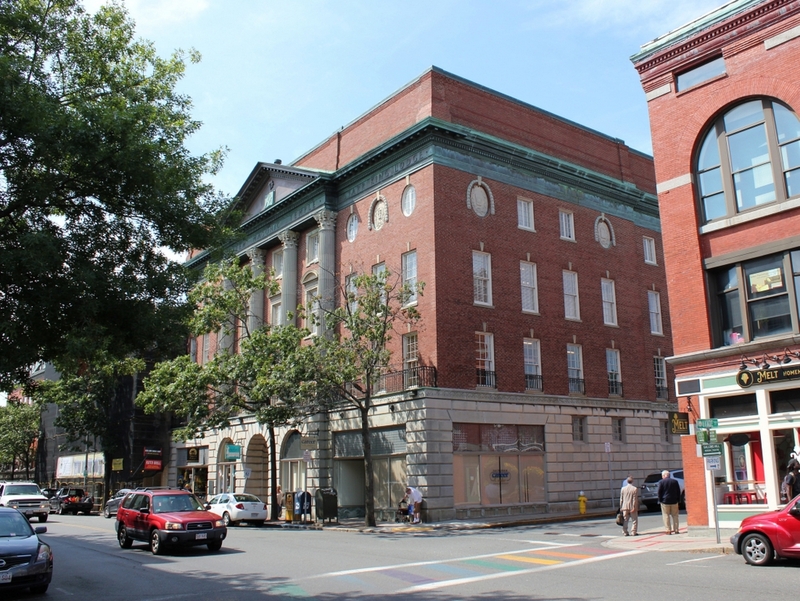 As was often the case in downtown commercial blocks, it was originally a mixed-use building, with stores on the ground floor, professional offices on the second floor, and apartments on the third floor. Further in the distance, on the right side of the scene, is the Brooks House, which was also known as the Hotel Brooks. Although completed in the same year as the Crosby Block, it featured far more elaborate Second Empire-style architecture that contrasted with the modest design of its neighbor. Designed by noted architect Elbridge Boyden, the hotel was reportedly the country’s largest Second Empire-style building outside of New York City at the time, and was a popular Gilded Age summer resort. It was owned by George Jones Brooks, a merchant who had grown up in the Brattleboro area but later made his fortune in San Francisco, as a merchant during the Gold Rush. However, he later returned to Brattleboro, where he built this hotel and also later founded the Brooks Memorial Library. More than 130 years after the first photo was taken, this scene has remained remarkably unchanged. The facade of the southernmost section of the Crosby Block, just out of view to the left, was rebuilt in the late 1950s and is now completely unrecognizable from its original appearance. However, the section of the building in this scene has been well-preserved, and still continues to house a variety of shops on its ground floor. On the right side of the scene, the Brooks House is also still standing. The interior was completely rebuilt in the early 1970s and converted into offices and apartments, but the exterior was preserved. 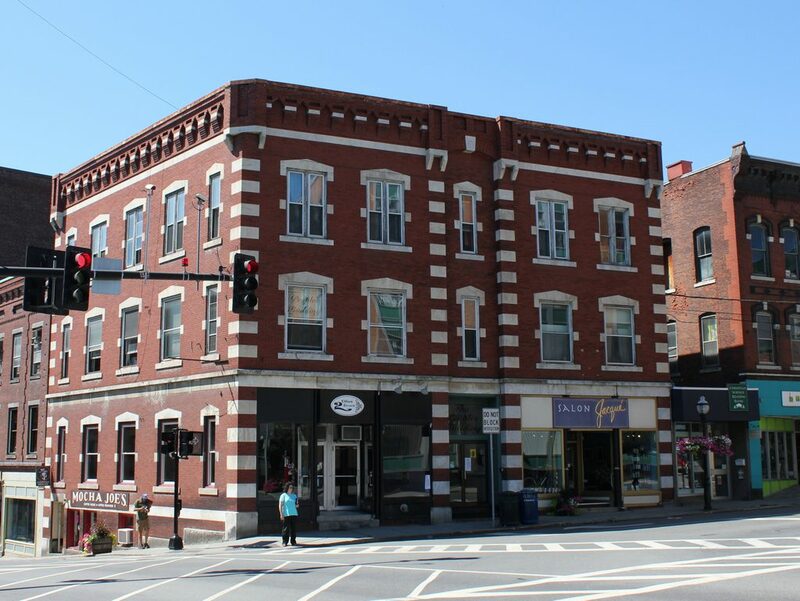 More recently, the upper floors were heavily damaged by a fire in 2011, but the building has since been restored and still stands as a major landmark in downtown Brattleboro. 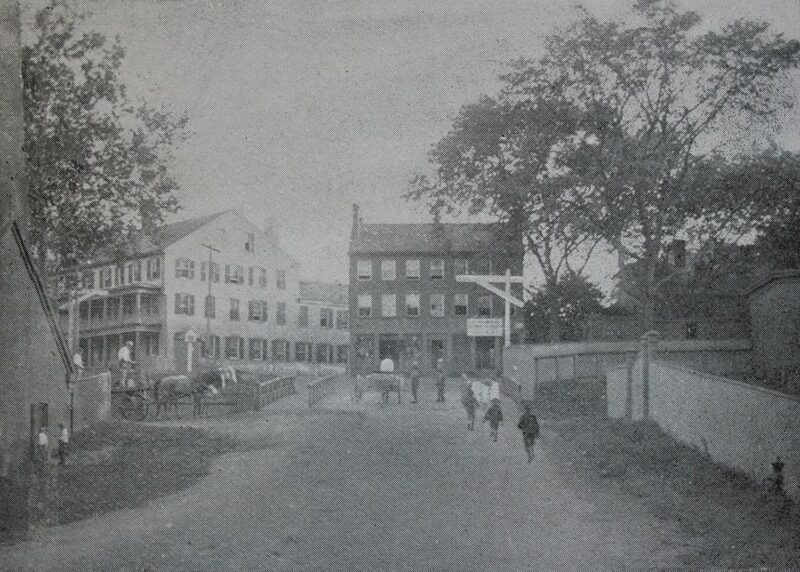 Looking south on Springfield Street, toward the Kendall House Hotel in Chicopee, around 1892. 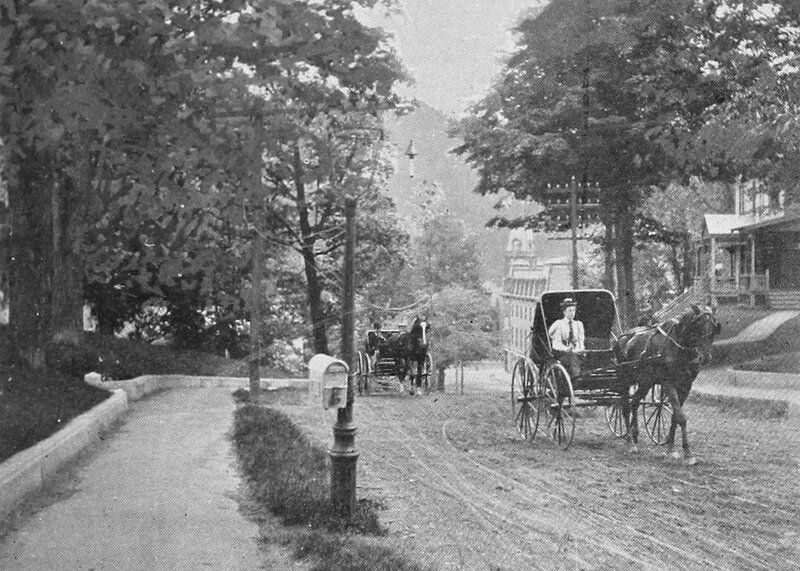 Image from Picturesque Hampden (1892). 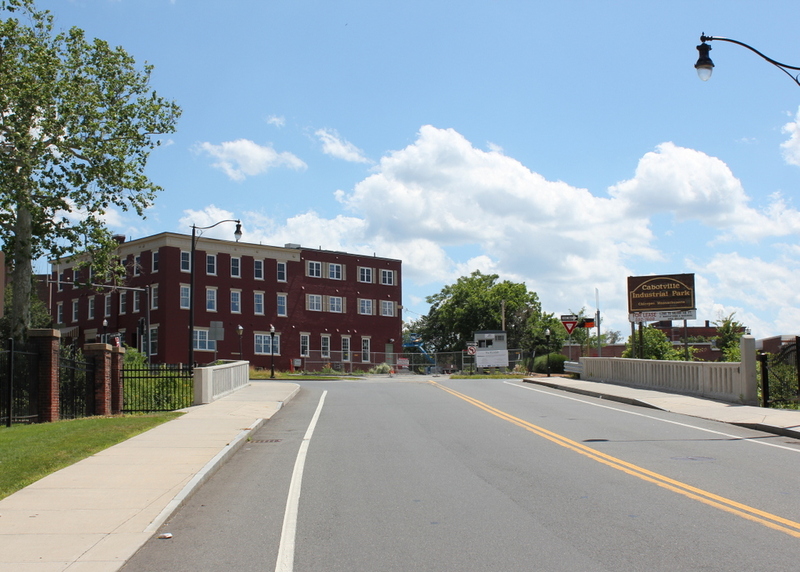 This scene shows the view looking south on Springfield Street toward the center of Chicopee, with the Chicopee River behind the photographer and the Ames Manufacturing Company facility just out of view to the left. The most notable building in the first photo is the Kendall House hotel, which is seen on the left side of the photo, just beyond the bridge over the canal. The hotel was built around 1834-1835, by prominent businessman Chester W. Chapin, and it dates back to the early days of Chicopee’s industrial development. At the time, Chicopee was still part of Springfield, and this particular area was known as Cabotville. The village was named after the Cabot Manufacturing Company, which was, in turn, named for Boston merchant Samuel Cabot, and this hotel was likewise originally named the Cabot House. As built, the Cabot House had a fairly plain, Federal-style exterior that was common for commercial buildings of the era, with a brick exterior, three and a half stories, and a gabled roof. It opened as the first hotel in Cabotville, and for the first few years it was operated by Gardner Kimball. In 1836, he hired Marvin Chapin (no close relation to Chester) as a clerk. A native of Somers, Connecticut, Marvin Chapin had just returned to the area after spending time on a surveying crew in Florida, and after just a few weeks here he purchased the Cabot House from Kimball. 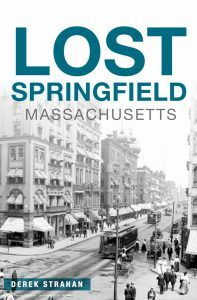 He and his brother Ethan operated the hotel for several years, but in 1842 they purchased property on Main Street in Springfield and built the Massasoit House, which opened the following year. The Massasoit House went on to become one of the leading hotels in Western Massachusetts, and the Chapins subsequently sold the Cabot House to Madison Kendall. The hotel later became known as the Kendall House, and enjoyed a prominent location in the center of Chicopee. The Chicopee Falls Branch of the Connecticut River Railroad opened in 1845, with a depot directly in front of the hotel, and three years later Chicopee was incorporated as a separate town. The current City Hall was later built across the street from the Kendall House, and in the meantime the factories here along the riverfront continued to expand, placing the hotel in the center of the city’s industry, commerce, transportation, and government. The first photo shows the Kendall House with its front section of three and a half stories, a rear section with two and a half stories, and a two-story porch. Adjacent to the hotel, in the center of the photo, was a similar building, known as Chapin’s Block, which was probably built around the same time as the Kendall House. The railroad depot is not visible from this angle, but the white crossing signs can be seen in the center and far left of the photo. The Ames Manufacturing Company, whose factory was soon to be purchased by Spalding, was located just to the left of this scene, and the Dwight Manufacturing Company was just to the right on the opposite side of Springfield Street. Some of the children on the street may have been child laborers for Dwight Manufacturing, similar to those who were documented by photographer Lewis Wickes Hine several decades later. Around 125 years after the first photo was taken, this scene has changed significantly. Chapin’s Block in the center of the photo is long gone, as are the buildings further in the distance to the right. The road bridge over the canal is new, and the railroad tracks are no longer there, having last been used in 1983. However, the Kendall House is still standing, although it is significantly altered from its original appearance. The gabled roof was removed after a fire in the early 20th century, and replaced with a flat roof and a cornice. The front porch is also gone, and the back part of the building has since been expanded into three full stories. Until recently, the building housed Quicky’s Restaurant and 38 single room occupancy units, but in 2017 the interior was completely renovated and converted into 41 studio apartments. 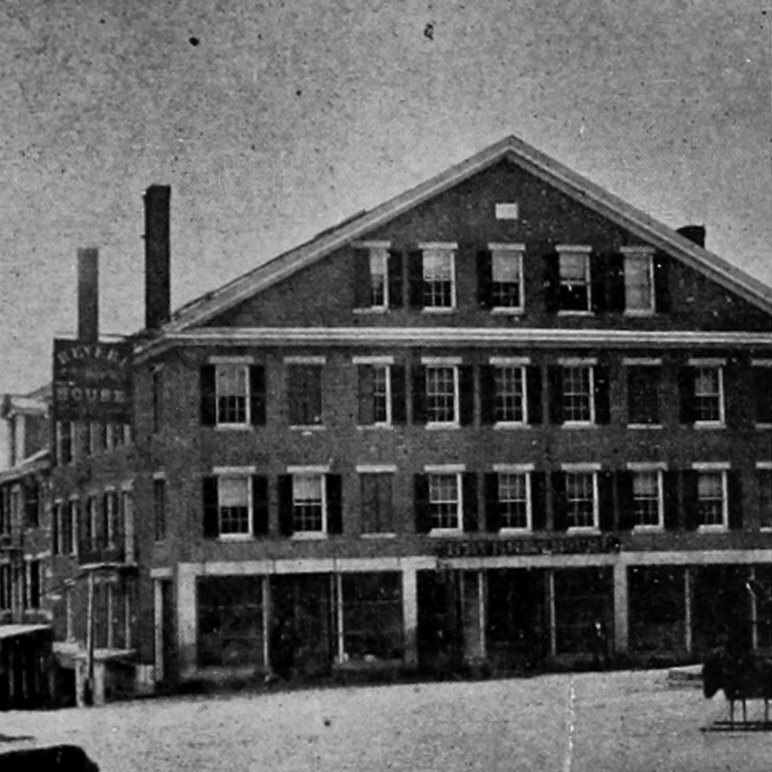 The Warner House hotel on Main Street in Northampton, sometime around the 1860s. Image from Northampton: The Meadow City (1894). The Warner House, seen on the left side of the first photo, had been perhaps the most prominent hotel in early 19th century Northampton. The wooden, three-story Federal-style building dated back to the 1790s, when it was built by Asahel Pomeroy, who operated it as a tavern. 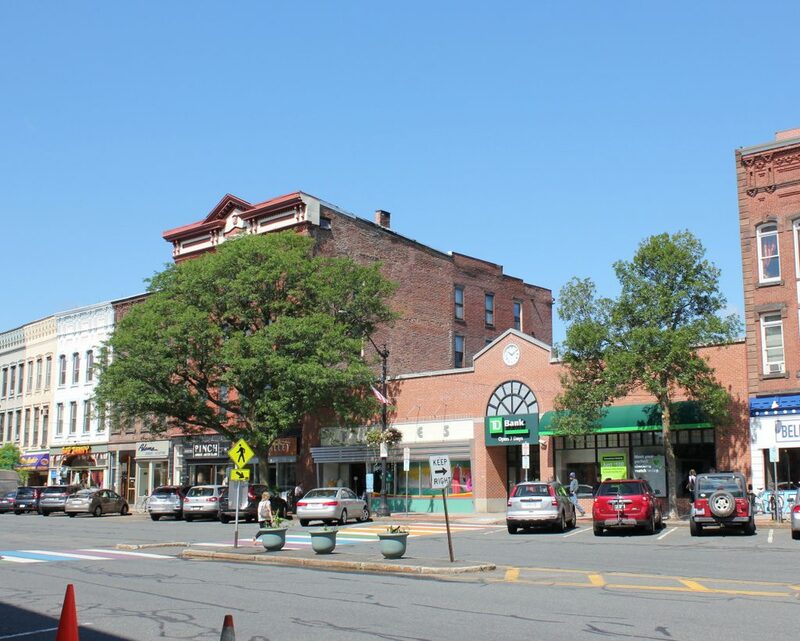 It was ideally located in the center of Northampton, where several major stagecoach routes crossed, including an east-west route from Boston to Albany, and a north-south route from New Haven and Hartford to Brattleboro and other points north. In 1821, the tavern was purchased by Oliver Warner, and it continued to serve as both a stagecoach stop as well as a popular gathering place for locals. Probably its most famous visitor during this time was the Marquis de Lafayette, who stayed here in 1825 during his grand tour of the United States. The Revolutionary War hero arrived in Northampton to much fanfare, and attended a reception and dinner in his honor here at the Warner House. He later gave a speech from the balcony, and spent several days in Northampton before continuing on his journey east. About a mile from Northampton we passed the Connecticut river, five hundred yards wide, in a small ferry-boat, which, as the night had already set in, was not very agreeable. At Northampton we took lodgings at Warner’s Hotel, a large, clean, and convenient inn. In front of the house is a large porch, and in the first story a large balcony. The gentlemen sit below, and the ladies walk above. Elm trees stand in front of the house, and a large reflecting lamp illuminates the house and the yard. This, with the beautiful warm evening, and the great number of people, who reposed on the piazza, or went to and from the house, produced a very agreeable effect. The people here are exceedingly religious, and, besides going to church on Sundays, they go thrice during the week. When we arrived, the service had just ended, and we saw some very handsome ladies come out of the church. Each bed-chamber of our tavern was provided with a bible. Warner’s Hotel is in the centre of the town, and in the midst of the trading part of the community. The house was inadequate in size to its business, and a large and very handsome addition has just been made to it, the rooms of which are spacious, airy and pleasant. The venerable proprietor has made a spirited and liberal outlay, by which he has added much to the beauty of the town, as well as promoted to public convenience; and we trust he will receive that ample remuneration he so well deserves. This “handsome addition” was likely the three-story brick building on the right side of the photo, which was built in the prevailing Italianate style of architecture, in sharp contrast to the 18th century tavern building. With this expansion, the hotel remained in business for the next two decades. However, the 1870s saw several disastrous fires in downtown Northampton, including one that started here in the Warner House. The fire burned for four hours, destroying the old hotel building, the newer brick addition to the right, and the Lyman Block on the left, and it caused about $125,000 in damage. In the wake of the fire, the site was rebuilt as the Fitch House, a large four-story brick, Italianate-style hotel building that was completed in 1871. The hotel was later named the Mansion House, and then the Draper Hotel,and it remained in business until it finally closed in 1955. 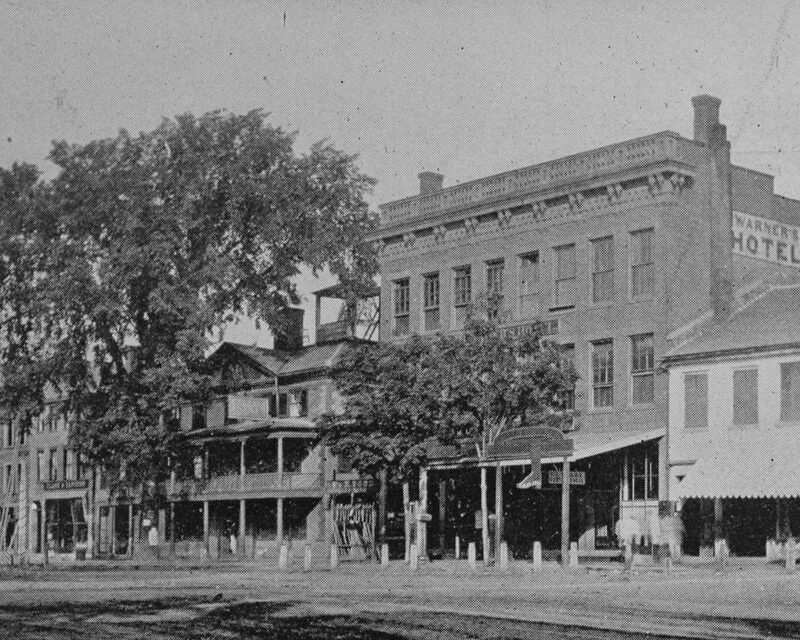 The eastern two thirds of the Draper Hotel was subsequently demolished, and the current one-story building was built in its place, but the westernmost section of the building is still standing, and can be seen on the left side of the present-day photo.